Ask a Japanese person what they eat in summer, and watch as their mind drifts off to memories of eating grilled ayu fish and kakigori (shaved ice) while watching fireworks. Ask them about autumn, and you’ll hear stories about the kurigohan (chestnut rice) and hoshigaki (dried persimmon) eaten after some koyo (autumn leaf-viewing). Spring recalls picnics under flowering cherry blossom trees, with a picnic rug lined with ichigo daifuku (sweet rice cake filled with red bean paste and a strawberry) and cups of sake laced with sakura petals. Winter, steaming bowls of nabe (hot pot) eaten at home under a kotatsu, or the tantalising scent of caramelizing sweet potatoes wafting down the street from a yaki imo (grilled sweet potato) van. It’s clear that seasonal eating runs deep in Japan. But beyond capitalizing on produce when it’s at its flavor peak, the tastes of the seasons are aligned with foods that provide specific health needs for that time of year, as documented by Sagen Ishizuka, the Meiji-era doctor to the Imperial Japanese Army and pioneer of the concept of shokuiku (healthy eating) and the macrobiotic diet. Shiki no shi aji, he noted, is the “taste of the four seasons.” Summer is vinegared, autumn is pungent and spicy, winter is oily and fatty, and spring is bitter. Japanese summers are hot and sweaty affairs, with average temperatures reaching 30 degrees Celsius and humidity hanging thick in the air. Natsubate (summer fatigue) strikes many, and bodies need replenishing and cooling. 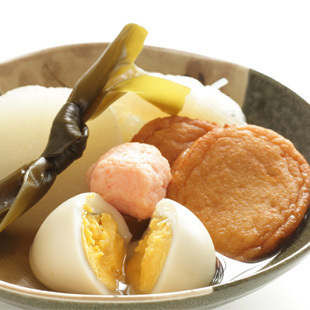 Beyond reaching for an ice-cold Asahi, vinegared and sour foods help to beat the heat. Vinegar can stimulate circulation to cool the body down, and provides a sense of refreshment on the system by stimulating saliva glands. Vinegar also has a preserving effect and antibacterial qualities, which is a convenient bonus during a season when food can easily go rancid. 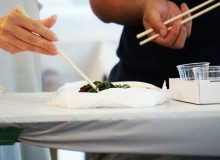 Try: Wakame and cucumber sunomono (Japanese vinegar salad), hiyashi chūka (cold ramen and vegetables flavored with vinegar), and aji no nanbanzuke (deep-fried, vinegar-marinated baby horse mackerel). Autumn is about building up energy reserves for the winter ahead, as well as compensating for physical strength worn off during the summer. The stockpiling of spicy foods, which are natural appetite enhancers, is encouraged. There’s even a Japanese saying, “Shokuyoku no aki” (“autumn is for hearty appetites”). 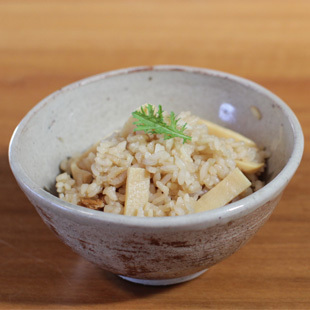 The ingredients in season during autumn are strong on the pungency front—green peppers, new buckwheat, sanma fish, mushrooms—and can be enhanced by piquant boosters like ginger, garlic, and onions. 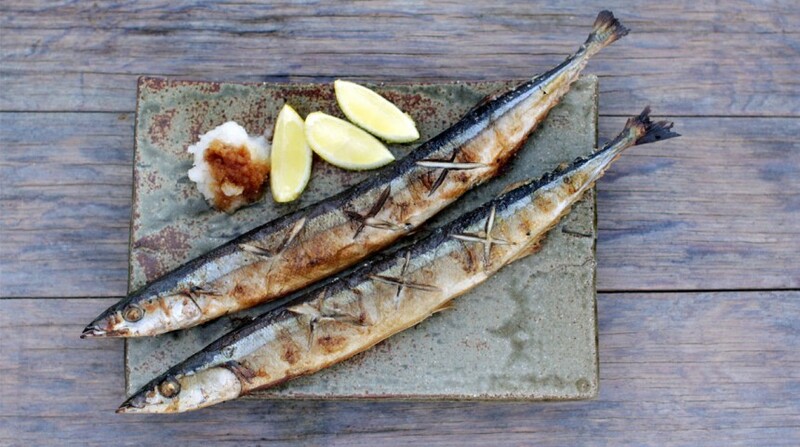 Try: Matsutake gohan (matsutake mushroom rice), green pepper yakitori, sanma grilled served with daikon, or sanma nigiri (fish pressed over vinegared rice) with ginger. When winter’s chill takes hold in Japan, bodies need physical strength to overcome the cold, and extra calories to restore the energy burnt keeping warm. This means eating foods higher in natural fats, as well as cooked with oil. Buri (amberjack), high in omega-3 fatty acids, is in its prime in the winter months, and hearty nabemono (hot-pot dishes) that feature fried or fattier ingredients are popular. Try: Buri daikon (amberjack stewed with daikon), oden (stewed hot pot), agedashi dōfu (deep-fried tofu in dashi), chanko nabe (a sumo favorite! ), and sukiyaki. 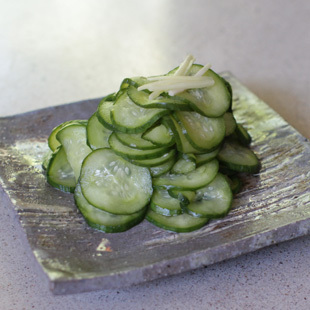 The bitter taste of spring comes in the form of sansai, spring’s wild mountain vegetables. These enchantingly gnarly-looking mountain vegetables start to sprout across Japan’s snow-blanketed fields from late February to early March, and are characteristically bitter. Their astringent properties help break down the fat storage and flush the toxins of idleness and heavier foods of winter. 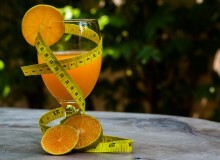 Many sansai are also rich in vitamin C, which helps digestion. Try: Taranome (angelica) and fukinoto (butterbur bud) tempura, takenoko mazegohan (bamboo shoots in rice), nanohana ohitashi (nanohana dressed with soy dressing seasoning), and grilled yama udo (mountain asparagus). 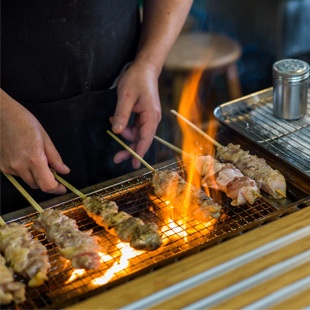 With izakaya banquets, kaiseki dining, bowls of ramen, sushi bars, and street food crawls, a food itinerary in Japan is a prodigious one. Shiki no shi aji’s seasonal taste cycle of cooling, replenishing and preparing, fortifying and warming, and cleansing can be used as a guide on your culinary adventuring to help cool you down, warm you up, and keep you nourished.